Traditional wired power transmission systems usually require lying of transmission wires between the distributed units and the consumer units. This produces a lot of constraints as the cost of the system- cost of the cables, the losses incurred in the transmission as well as in distribution. Just imagine, only the resistance of the transmission line results in loss of about 20-30% of the generated energy. If you talk about DC power transmission system, even that is not feasible as it requires a connector between the DC power supply and the device. Imagine a system completely devoid of wires, where you can get AC power to your homes without any wires. Where you can recharge your mobile without having to physically plug in to the socket. Where the battery of the pacemaker (placed inside a human heart) can be recharged without having to replace the battery. Of course such a system is possible and that’s where the role of Wireless Power Transmission comes. This concept is actually not a new concept. This whole idea was developed by Nicolas Tesla in 1893, where he developed a system of illuminating vacuum bulbs using wireless transmission technique. We cannot imagine a world without Wireless Power Transfer is feasible: mobile phones, domestic robots, MP3 players, Computer, laptops and other conveyable gadgets fit for charging themselves while never being connected to, liberating us from that final and ubiquitous power wire. Some of these units may not even require much number of electric cells/batteries to operate. Inductive Coupling: One of the most prominent methods of transferring energy is through inductive coupling. It is basically used for near field power transmission. It is based on the fact that when current flows through one wire, a voltage is induced across the ends of the other wire. The power transmission takes place through mutual inductance between the two conductive materials. A general example is the transformer. Microwave Power Transmission: This idea was developed by William C Brown. The whole idea involves converting the AC power to RF power and transmitting it through space and again reconverting it to AC power at the receiver. In this system power is generated using microwave power sources like klystron, and this generated power is given to the transmitting antenna via the waveguide (which protects the microwave power from reflected power) and the tuner (which matches the impedance of the microwave source with that of the antenna). The receiving section consists of the receiving antenna which receives the microwave power and the Impedance matching and filter circuit which matches the output impedance of the signal with that of the rectifying unit. This receiving antenna along with the rectifying unit is known as the Rectenna. The antenna used can be a dipole or a Yagi-Uda Antenna. The receiver unit also consists of the rectifier section consisting of schottkey diodes which is used to convert the microwave signal to DC signal. This transmission system uses frequencies in the range of 2GHz to 6GHz. 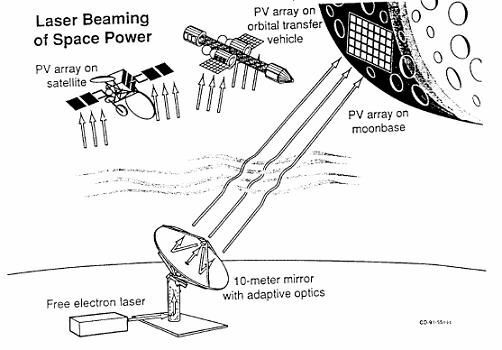 Laser Power Transmission: It involves the use of LASER beam to transfer power in form of light energy, which is converted to electric energy at the receiver end. The LASER gets powered using sources like Sun or any electricity generator and accordingly generates high intensity focused light. The beam size and shape are determined by a set of optics and this transmitted LASER light is received by the photovoltaic cells, which convert the light to electrical signals. It generally uses optical fiber cables for transmission. Like in basic solar power system, the receiver used in LASER based transmission is the array of photovoltaic cells or solar panel which can convert the incoherent monochromatic light into electricity. One of the most advanced wireless power transfer system is based on transferring solar power using microwave or LASER beam. The satellite is stationed in the geostationary orbit and consists of photovoltaic cells which convert sunlight into electric current which is used to power a Microwave generator and accordingly generate microwave power. This Microwave power is transmitted using RF communication and received at the based station using a Rectenna, that is a combination of an antenna and a rectifier and is converted back to electricity or required AC or DC power. The satellite can transmit up to 10MW of RF power. The basic principle involves converting the AC power to DC power using rectifiers and filters and then again converting it back to AC at high frequency using inverters. 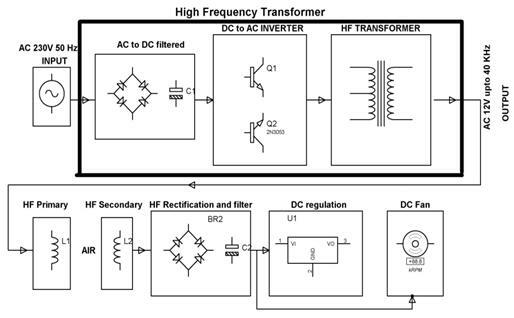 This low voltage high frequency AC power then passes from transformer primary to its secondary and is converted to DC power using rectifier, filter and regulator arrangement. The AC signal is rectified to DC signal using a bridge rectifier section. The obtained DC signal passes through the feedback winding1, which act as oscillator circuit. Current passing through the feedback winding1 causes the transistor1 to conduct, allowing DC current to flow through the transistor to the primary of the transformer in left to right direction. When current passes through the feedback winding2, the corresponding transistor starts conducting and the DC current flows through the transistor, to the primary of the transformer in right to left direction. Thus an AC signal is developed across the primary of the transformer, for both half cycles of the AC signal. The frequency of the signal depends on the oscillation frequency of the oscillator circuits. This AC signal appears across the secondary of the transformer and as the secondary is connected to primary of another transformer, a 25 KHz AC voltage appears across the primary of the step down transformer. This AC voltage is rectified using bridge rectifier and is then filtered and regulated using LM7805 to obtain a 5V output to drive an LED. The voltage output of 12 V from capacitor is used to power the DC fan motor to operate the fan. Sir can u tell me what n all components required for this project…. I’m so interested to do this project. I want do B.tech project on wireless power transmission through any system either it can be solar power system or any other . currently I’m in 3rd year. so please suggest me what kind of project should I do.